You asked for a set of wheels that is practical, tough, sporty and fun. May we proudly present the Roughhouse 50! This scooter offers rock-solid weekday transportation and penny-pinching economy. The generous underseat storage, combined with an optional rear rack and top case make your Tuesday night trip to the grocery store a breeze. But like the name implies, the Roughhouse isn't afraid to have a little fun on the weekends. 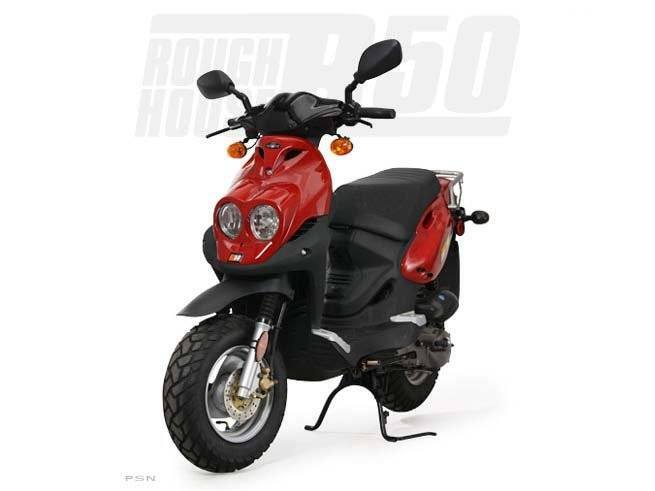 The improved 50 cc performance lets you easily evade Sunday drivers while dual-sport knobbies keep you going when the pavement ends. The Roughhouse is knocking, wanna come out and play?